The Lahinch Golf Club, perched on the Wild Atlantic Way in County Clare, will host the 2019 Irish Open. In fact Lahinch is just one of many globally renowned golf courses nestled on the Wild Atlantic Way. The South West of Ireland is considered by many to have the best concentration of links courses on the planet. There is nowhere better for a group to enjoy great golf, spectacular scenery, excellent food … and an opportunity to relax in some of Ireland’s famous pubs listening to traditional music. 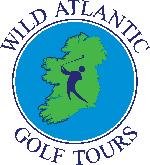 For customised golf trips , please contact info@wagt.ie. Further information available on www.WildAtlanticGolfTours.com .